[Thomas Clater, English artist.] Autograph Letter Signed ('Thos Clater') to T. W. Winstanley, Secretary, Royal Manchester Institution, giving catalogue details of two paintings he is exhibiting in the Manchester Exhibition of 1842. 11 Whiteheads Grove, Chelsea. 12 August 1842. 1p., 4to. Bifolium. In good condition, lightly aged. Addressed by Clater on verso of second leaf to 'T. W. Winstanley | Royal Manchester | Institution'. Opens: 'Dear Sir | I beg leave to forward to your Exhibition two pictures'. 'No 1', which Winstanley has given the catalogue number 294 is 'May day', priced at 100 guineas, for which Clater provides a six-line poetic quotation. 'No 2' (catalogue number 135) is 'The Village Post Office', priced at 30 guineas. [Caleb Robert Stanley, English artist.] Autograph communication, with Stanley's name ('C R Stanley') and address, to [T. W. Winstanley] Secretary, Royal Manchester Institution, giving details of two paintings for its 1842 exhibition. 'C R Stanley | 25 Gt Maddox St | Hanover Sqre. [London]' 9 August 1842. 1p., 4to. On bifolium. In good condition, lightly aged. Addressed by Stanley, with red wax seal, on reverse of second leaf, to 'The Secretary | In the Manchester Institution | Moseley [sic] St | Manchester'. The text itself consists of the names and prices of the two pictures to be submitted to the 1842 show, with the date and Stanley's name and address: 'No 1. | Water Mill | North Devon | 25£ with Frame. | No 2 | Lane Scene | Painted from Nature | 25£ with Frame | C R Stanley | 25 Gt Maddox St | Hanover Sqre. | August 9th. 1842'. [ Lord Glasgow. ] Autograph Note Signed ('Glasgow'), to the Hon. Sec. of the Naval and Military Relief Exhibition, Edinburgh, sending his best wishes but declining to take part in its fund. 21 Chapel Street, Belgrave Square, London S.W. 20 April 1889. 1p., 12mo. In good condition, lightly aged. 'While wishing all good success to the proposed Naval & Military Relief Exhibition', he is sorry that he does not feel able to 'take part in the <?> fund'. [ Cecil Lawson, landscape painter. ] Autograph Note Signed ('Cecil Lawson') to London art dealer C. W. Deschamps, regarding the Melbourne International Exhibition. Bolton Bridge, Skipton, Yorkshire. 21 July 1880. [ The Hollands ] Autograph Letter Signed "C Fox" to "Sharpe" , about the Duc de Richelieu (6th Duke) abd his trip to Scotland.). Charles Richard Fox (1796-1873), soldier/politician etc., illegitimate son of Henry Richard, 3rd Bar.Holland and Lady Elizabeth Vassall, later Lady Webster and even later later Lady Holland. Three pages, 8vo, sl. crumpled but text clear and complete, though something of a scrawl. He apologises for hasty writing, and asks of "the Exhibition at Manchester [Art Treasures Exhibition?] is open or to be seen on Sundays [Underlined]. The D[uc] de Richelieu is going to Scotland & can only go there on Sunday. To save time perhaps you would be so good as to answer him yes [underlined] or no [underlined][.] [H]e knows English thouroughly well". He gives the full Holland House address for where the Duc is staying. [ Richard Redgrave, RA. ] Autograph Note in the third person, and Autograph Letter Signed ('Rich Redgrave'), to Clara Angela Macirone, in the latter complaining of the 'labours' caused by his work on the 1862 International Exhibition in London. Note: Mickleham; 5 June 1847. Letter: Kensington; 6 May 1862. Both items in fair condition, on aged paper. NOTE: 1p, 12mo. He thanks her for an invitation to one of her concerts, 'rendered, as it is, more agreeable by the compliment she so agreeably pays to the sister art which he pursues'. LETTER: 2pp., 12mo. Bifolium. He would have replied sooner to her concert invitation, 'but the arrangement of pictures for the Gt Exhibition occupied my time up to the last moment of opening and has done for many weeks'. He has been 'so wearied with my late work that I am proposing to get away from town for a little rest the very concert day. [ William Cavendish, 7th Duke of Devonshire. ] Autograph Letter Signed ('Devonshire') to Sir George Scharf, regarding the loan of his gems to the International Exhibition, and the miniatures at Chiswick House. Holker, Newton in Cartmel. 24 March 1862. 3pp., 12mo. Bifolium. In good condition, lightly-aged. [Walter William Ouless, portrait painter.] Autograph Letter Signed ('W. W. Ouless') to 'Mr. White' [John Forbes White? ], regarding the contribution of paintings to an exhibition in Aberdeen. On letterhead of 12 Bryanston Square. 27 October 1887. Both catalogues disbound from a volume of pamphlets, and bound together with library stitching. Aged and worn, with wear and chipping to extremities. The first (1769) catalogue with library shelfmark in manuscript on reverse of title-leaf. Flyleaf with ownership inscription of 'R. N. Wornum | 1855' and note 'Reprinted at the expense of Sir Thomas Lawrence'. First (1769) catalogue: 15pp., 4to. On laid paper with crown and monogram 'G R' watermark. Second (1770) catalogue: 22pp., 4to. On wove paper with '1825' watermark. [Printed item.] Worshipful Company of Fan Makers. Catalogue of Fourth Competitive Exhibition of Fans, etc. Held by kind permission at Drapers' Hall [London], May, 1897. 58 + pp., 8vo. Frontispiece photograph of Queen Victoria, seated with a fan. In yellow wraps ornately printed in brown (discoloured gold?). Disbound from volume of pamphlets, with library stitching to spine and small '5' in ink at head of cover. Advertisements on wraps and final leaf. Descriptions of 479 fans (no illustrations), the first four lent by Queen Victoria. Four page index listing scores of lenders, including Mrs Leopold de Rothschild, Princess Louise, the Marchioness of Bristol, the Irish Lace Depot, the London Glove Company, and the Duchess of York. [Printed pamphlet.] Intermediate Education Board for Ireland. 1909. Exhibition and Prize Lists. Boys & Girls. 73pp., 8vo. In blue card wraps, with notice on pink slip tipped-in at front. In fair condition, on aged paper, with rusting staples. Shelfmarks, stamp and label of the Board of Education Reference Library. Giving the names and schools of the recipients of various prizes. Scarce. [Printed paper.] Special Report to the Honourable the Minister of Education, on the Ontario Educational Exhibit, and the Educational Features of the International Exhibition, at Philadelphia, 1876. Toronto: Printed by Hunter, Rose & Co., 25 Wellington St West. 1877.
vii +  + 306pp., 8vo. With sixteen plates (of engraved illustrations and plans) and fold-out frontispiece as called for. In grey printed wraps. Shelfmark and labels of the Board of Education Reference Library, London. Adam Crooks, Minister of Education, Education Department, Ontario, Canada. Toronto: Printed by Hunter, Rose & Company. 1876. 8vo, 23 pp. In original yellow printed wraps. Text clear and complete. Fair, on aged paper; wraps worn and with slight loss to a couple of corners. 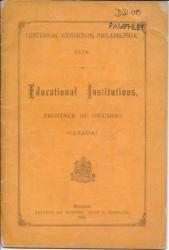 Red label on rear cover: 'Education Department. Reference Department.' Library stamp and shelf marks on front cover and title page. Signed in type at end: 'ADAM CROOKS, | Minister of Education. 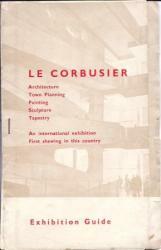 [Pamphlet] Le Corbusier. Architecture Town Planning Painting Sculpture Tapestry[.] An international exhibition First shewing in this country[.] 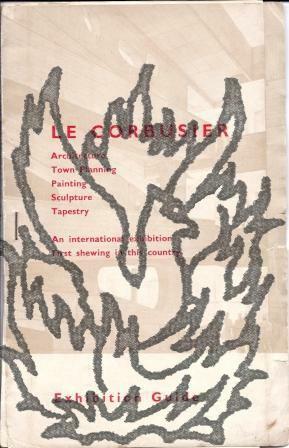 Exhibition Guide. 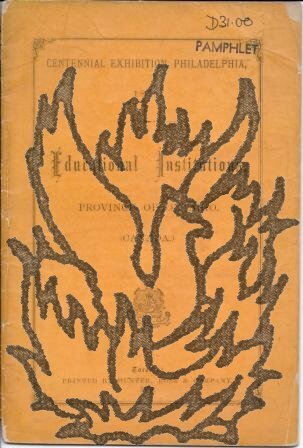 Four folding leaves (6 pages of print, probably mimeographed or similar), 12mo, unpaginated but apparently complete, one staple, illustrated cover with title as above, damage to spine, closed tears, contents good, two minor changes (including imitate changed to mitigate). Two galleries are mentioned in the text (containing works), the Wavertree Gallery, Bowring Gallery, and the Prince George Gallery. Wavertee suggests Liverpool, but I aait ilumination as to place. However the only copy recorded on COPAC and WorldCat finds itself in Cardiff (minimally described).